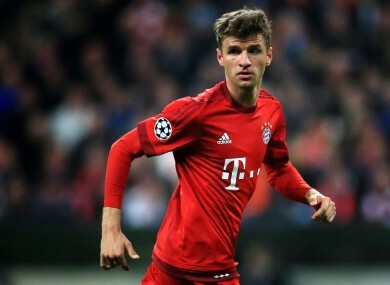 FOR A WHILE, there were relentless rumours about Thomas Müller potentially joining Manchester United. Louis van Gaal had given him his debut at Bayern Munich and there was a feeling a generous financial package could be enough to persuade the attacker to swap the Bundesliga for England. But now it seems United have little hope in acquiring the 26-year-old as he’s penned a new deal with the German giants that will keep him at the Allianz Arena until 2021. Jerome Boateng and Javi Martinez signed similar deals while 34-year-old Xabi Alonso has agreed a one-year extension. All in all, not a bad Christmas present for Bayern fans. Email “Rumours of Müller to Man United can finally be put to bed as he signs new Bayern deal ”. Feedback on “Rumours of Müller to Man United can finally be put to bed as he signs new Bayern deal ”.